New York State is one of the best places in the world to experience amazing autumnal colours. 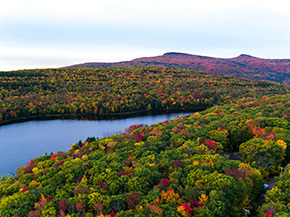 From the foothills of the Catskill Mountains to the peaks of the Adirondacks, the spectacular array of vivid colours on offer across the state during fall is a sight to behold. There are also many ways to view them – you can see the changing leaves from the road, the air, a hiking trail or a canoe, each mode offering a stunning perspective of one of nature’s most impressive displays. New York State offers plenty of chances to roam in the mountains. The Catskill Forest Preserve is where waterfalls and high peaks await, where you can see orange and brown leaves fall peacefully into pools of water or the ground far below. Alternatively, the summit of Prospect Mountain above Lake George Village is somewhere where spectacular views are guaranteed – visitors can choose to walk or take the bus to the top. Niagara Falls is undoubtedly worth a visit for the incredible chance to witness and experience the more than 567,000 litres of water that pass over the falls per second, but there is also some fantastic fall foliage in the wider region such as Devil’s Hole State Park and Whirlpool State Park that shouldn’t be ignored. Both of these parks offer several miles of panoramic views of the scenic Lower Niagara River gorge, while nearby ‘the Grand Canyon of the East’ is the nickname that has been given to Genesee Gorge at Letchworth State Park. Upstate New York is also home to 11 long, narrow lakes known as the Finger Lakes, near the huge Lake Ontario and part of the Appalachian swathe. Dense foliage engulfs many of the lakes and the reds, yellows, oranges and browns merge and reflect off the lake’s surface. With over 100 wineries and vineyards, the region is New York’s largest in terms of wine production, meaning travellers can enjoy a fine tipple along with the views. 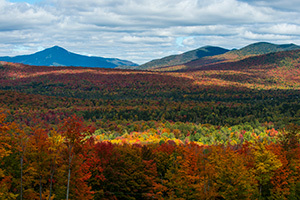 Views of the Adirondack Mountains to the north, the Taconic Mountains to the east and the rolling Helderberg Mountains to the south are all available from one spot: Saratoga Monument. There are nearly 190 stairs to climb to its 154-foot peak and see the incredible swathes of colour and landscape. 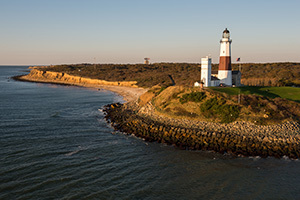 New York’s easternmost point, Montauk Point Lighthouse – the oldest lighthouse in the state – points to westward horizons out of one window, and stunning views of fall foliage out of another. Last but not least, the Dunkirk Lighthouse on Lake Erie still guides maritime voyagers to its historic 61-foot tower. The view of the fall leaves against the blue water at both of these high points is breath-taking.